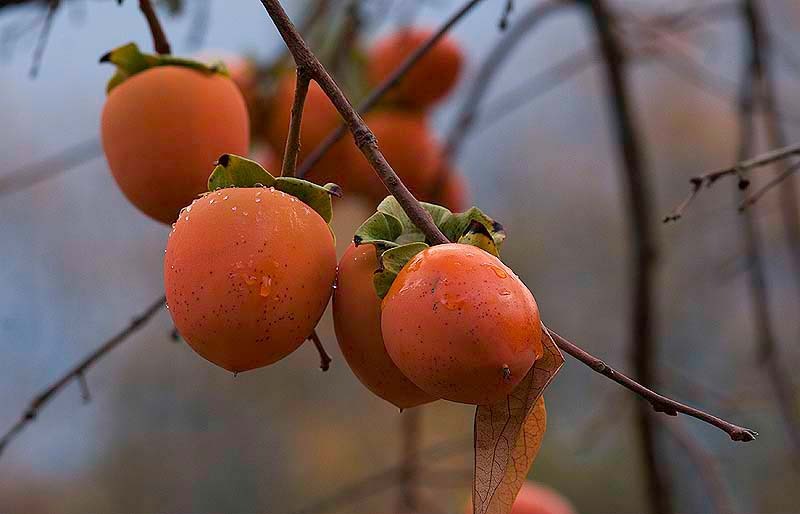 When the fruit of other orchard trees is long gone, the Hachiya Persimmon is at its peak. The late-ripening persimmons hang on through early winter rains and snowstorms. By the holidays, they dangle like giant ornaments from the barren branches, making a most natural Christmas tree. And Hachiyas are good to eat, too! Few things more beautiful than a persimmon tree bare of leaves and laden with fruit against a winter sky. Lovely photo of a piece of this. Thanks for the persimmons you gave me. I made a persimmon bread loaf. Yum!!! Our persimmon pudding for Christmas dinner brought the beauty of the Wild Gulch to our family table. Thank you! Beautiful shot! Love the colors. Stunning photo. The color and muted palette are just outstanding.